The MAVEN mission is inviting people from all over the world to submit their names and a unique message online. 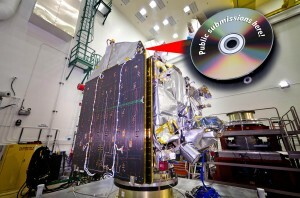 Participants’ names and the top-voted messages will be burned to a specially designed DVD and sent to the Red Planet aboard the MAVEN spacecraft, scheduled to launch in November 2013. The messages must be submitted in English in the form of a three-line poem, or haiku; the top three haikus will be selected to fly to Mars. The deadline for all submissions is July 1. An online public vote to determine the top three messages to be included on the DVD will begin July 15. The DVD label will contain a winning student artwork submission; voting on submitted artwork is ongoing and ends on May 6. “The Going to Mars campaign offers people worldwide a way to make a personal connection to space, space exploration, and science in general, and share in our excitement about the MAVEN mission,” said Stephanie Renfrow, Education and Public Outreach lead for MAVEN. Participants who submit their names to the Going to Mars campaign will be able to print a certificate of appreciation to document their involvement with the MAVEN mission.